Power on #2, so much! Today I rewired the pickguard underbelly, or at least I replaced all the wires which were previously wired using the shielded cable. I went to my local hardware store at lunchtime and bought a role of 16 gauge stranded and insulated copper wire and replaced all the shielded cable. Taking the pickguard off means taking off the neck and the strings etc so this is not a tiny job but I did it. Unfortunately I didn’t take photos of this because I am starting to get very irritated at removing and replacing the pickguard several times a day. Then as I put the guitar back together, I wondered how I might test the system without needing to re-assemble everything. It’s a bit of a quandary. I need something ferromagnetic which vibrates hundreds of times per second that I can use to generate a signal on the pickups. Hmm. Maybe a tuning fork would work? Sadly I don’t own a tuning fork. Anyway, I put the guitar back together but tested the new wiring as early as possible, which meant just after I had the neck back on and one string installed. 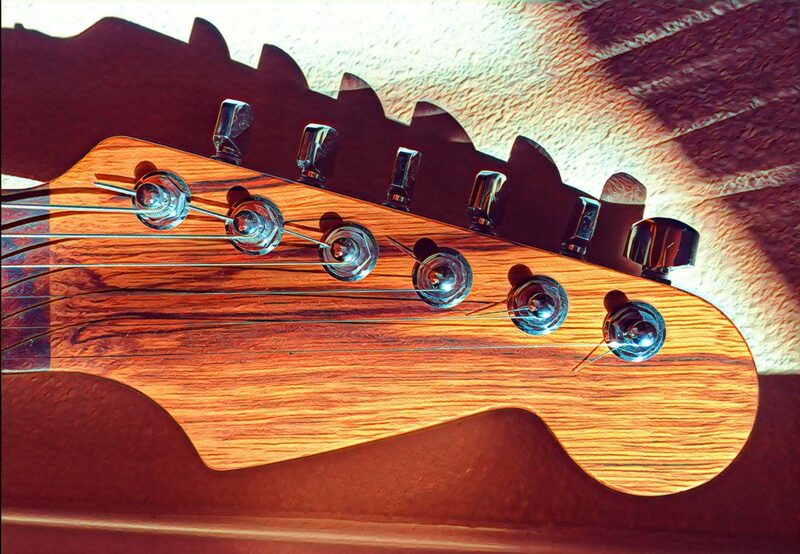 If anything is still wrong, I need to minimize the time to getting back inside the guitar cavity. You’ll see the jack is not installed yet either – it is sticking out of the guitar. Two great bits of news. First, there is sound! And second, it’s the right sound! I quickly threw on the strings, tuned it, and tried to see how these mighty humbuckers sounded and they sound great: deep, resonant, mournful. I’ll spend some more time wrapping things up on this guitar and maybe post a summary of the project in a few days. I’d also like to spend some time playing the guitar and trying to explore all its tones. Also, I need to start thinking about the next guitar project! If you have suggestions, send ’em my way. Previous: Previous post: Power on! Or not so much. Nice sound! Now put it all together and let’s hear a rift!! !